Made by Romance was Born in Sydney, New South Wales, Australia, 2009. Sleeveless dress designed in the shape of Arnott's 'Iced Vo Vo' biscuit. It comprises a rectangular body made of light brown fabric with a scalloped edge. 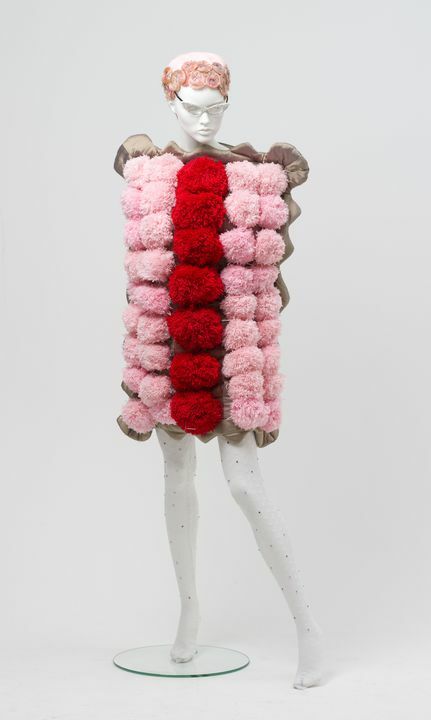 The dress features a single row of seven red woollen pom poms down the centre front and two rows of seven pink pom poms down each side of the central row. The ensemble also includes a pair of cobalt blue platform high heels decorated with pink and red fabric flowers. The dress was designed by Anna Plunkett and Luke Sales of Australian fashion label, Romance Was Born, in Sydney, New South Wales, Australia in 2009.